A preview of tomorrows post - sorry that it took so long. Sorry for the lack of posts lately I had to study a lot but for now I have a little free time! The weather the past few days was just perfect but with the sheer blouse it was way too cold! I normally don't wear high heels but I literally fell in love (got the joke?) with those from Zara. I also bought a dress which you will see soon. I'm in a hurry have a nice day everyone! 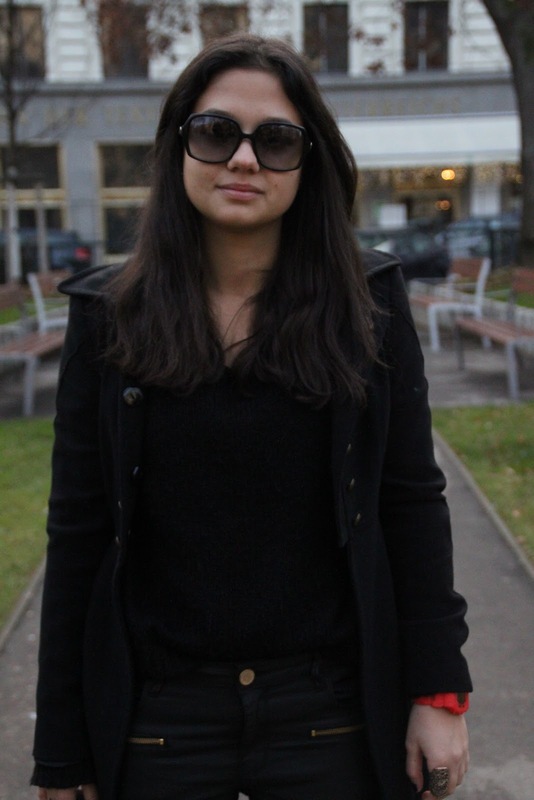 So as you may now, I am very busy right now and the weather isn't good at all for an outfit post (snow!) but I hope you will be pleased with this short post. I have been looking for a classic, black leather bag for a long time now and I think I finally found it. Yes I know, it is not only black but thats exactly what I like most about it. Also the leather is super soft and the best thing, I bought it for only 20€ at H&M. I never thought I'll buy a bag there but hey, here it is, also I never thought I will wear skinny jeans 10 years ago and look at me haha. Hope you have a nice evening (day) everyone. The weather today was just perfect for an outdoor shoot! As promised my new shoes from topshop which I adore! I can't take them off, they are so comfortable and the leather is really soft. I got the blazer a few months ago but I din't had the opportunity to wear it because it is a very soft and thin one, perfect for this weather! The bag is a chanel likely vintage bag from my grandmother, the quality is amazing but it is very small. I hope spring is coming earlier this year! I hope you are still able to find my blog in the world wide web. I wore a grey shirt, a dark green parka with my black leather pants (I can't not wear them!) and my new shoes from topshop which you will meet soon, hopefully. Also this is my favorite song at the moment! Enjoy and have a nice evening (day?) everyone! CHANGE. yes.yes.yes. A new year screams for change. I will stop with those very very very annoying "mirror photos". No more - I promise. Also you will notice some change on the blog, hopefully in a little while and I hope I will be able to post more often and more about music, by the way I have a new playlist (can't stop listening to it) I will show you, step by step. What did you do at New Years Eve? I know I'm such a bad blogger - don't know if I can even call me like that - no post about what I wore, but seriously my outfit wasn't that exciting. A little late but still I wish you a happy new year, may all your wishes come true.